Watching: After going to the cinema 5 times back in April, I haven't been at all this month. With so many other events going on in Dundee it's been hard to find the time! I have managed to fit in a bit of Netflix binging though, usually while editing photos for this here blog. 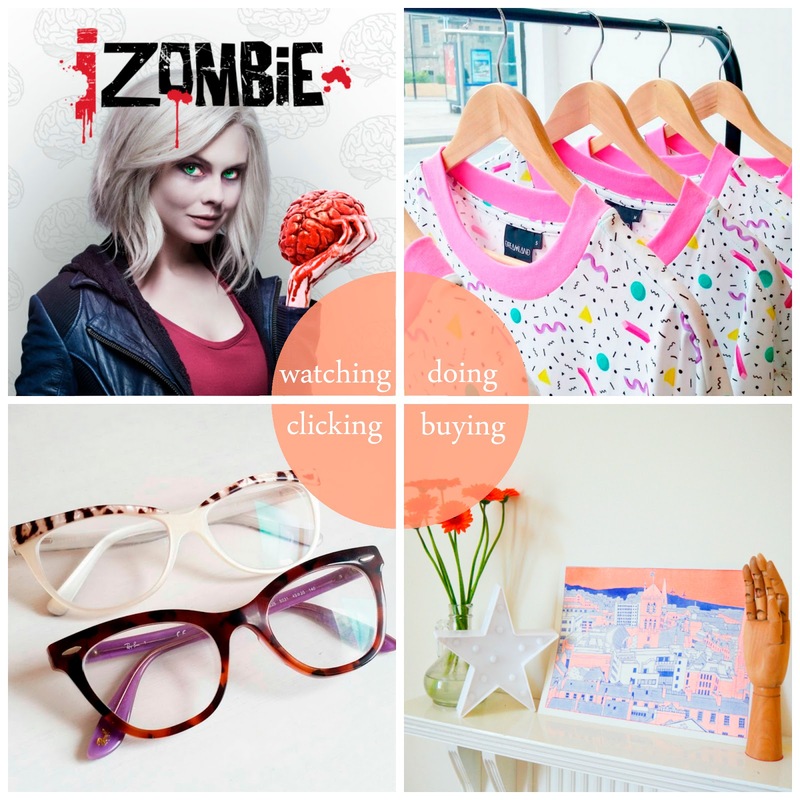 My programme of choice this month has been iZombie. As much as I love all things zombie I was slightly put off by the ridiculous premise. Girl becomes zombie, girl uses zombie powers to fight crime. But I decided to give it a go. Turns out it's rather good! Strong female lead - check, humour - check, over the top bad guys - check. It pretty much ticks all the boxes for me. Doing: May has been a super busy month for events in Dundee. From pop up markets, vintage fairs, Tea Green, the DJCAD degree show, Pecha Kucha, Scottish Jewellery Week, Dundee Design Festival, Ignite and Festival of Museums, it's been all go. One event I'd been looking forward to since the start of the month was Dreamland's new collection launch. Designer, Ruby Coyne's colourful items have appeared here a number of times so I was very excited to see what she had up her sleeve for her newest collection. Dimensions is a small but perfectly formed mix of tshirts and sweatshirts. It has the perfect unisex vibe with loose silhouettes and jazzy 80's style prints. For me it's another fun and colourful success. Buying: With all the pop ups that have been going on I'm amazed I haven't bought more this month. Probably because I've been doing quite a bit of eating out which has eaten into my funds. I did treat myself to an illustrated print at the pop up teen market. It's bright and features the rooftops of Dundee. It's by young designer Shona Heaney. I really liked her drawing style and all the geek references in her work. Clicking: Kimberley and I have been getting our DIY on for Cut Out and Keep and my post went live on Saturday. 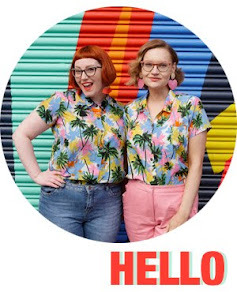 There's a Q&A with me, a colourful outfit and a how to guide for making my necklace. It's pom pom-tastic. Kimberley's will be coming up next week. In the meantime I've been exploring the site and bookmarking some projects to try. Also online this month, Spex Pistols (my glasses heaven) launched their shiny new website. I would always highly recommend that you head to their super stylish store in Dundee for cool decor and top notch customer service, but I know that may not be possible for everyone. Now you can shop their awesome selection from your home using their slick new site. There's a great range of prices and styles, from fabulous vintage frames to brands like Ray-Ban and William Morris. Browsing could get seriously dangerous for your bank balance. I've run out of fingers to count my favourites on. 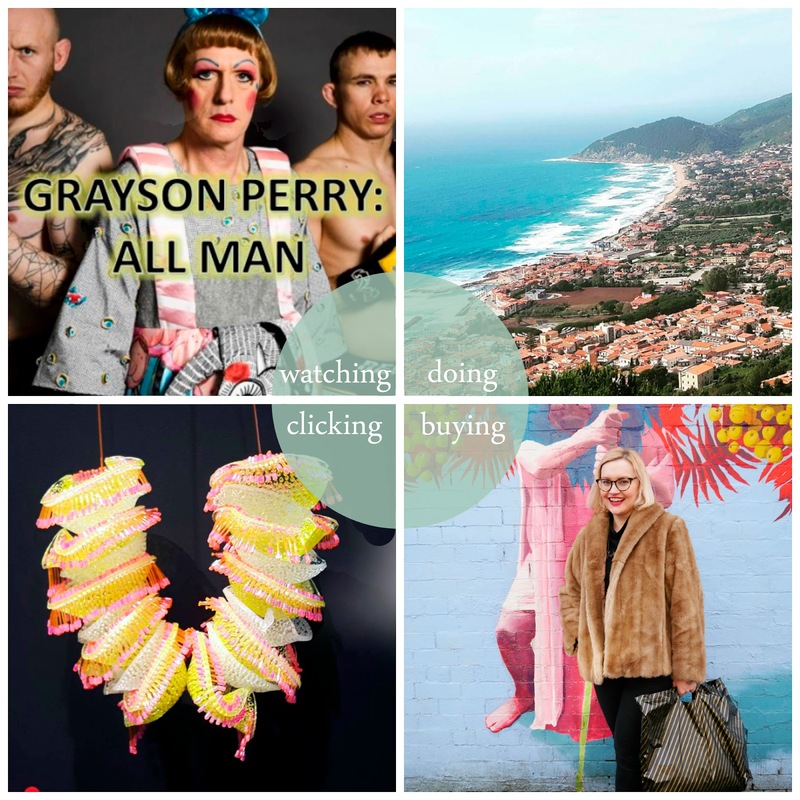 Watching: I've been watching Grayson Perry: All Man. The series follows the artist's exploration of masculinity in British society, where he visits men who have 'ultra-male' roles through work or sports, and finds out what makes them tick (spoiler: they have feelings and emotions). He is a really great presenter of it, offering a lot of insight into his own world, and I'm enjoying it so far. Doing: It's been a busy month of non-blogging activities. Obviously I squeezed in the Flamingosaurus Rex shoot and the Dundee visit for Festival of Museums and Tea Green Pop-up, but I also jetted off to Salerno, Italy, for a work trip and squeezed in a few hours of sunshine and gelato. You can follow my journey on my Instagram account. I also got some TLC in the form of 80s jumper- inspired nails at Cutie-Kills (more on that soon) and I have been eating out a lot with new friends. I tried out Grams gluten-free, dairy- free cakes and Candy Bar's menu. Buying: In writing this I have suddenly realised that I have not bought anything this month! Go me, accidentally overcoming my shopping addiction for one single month. I guess because I've been too busy organising my Italy trip, buying practical items like a suitcase and suncream, and digging out my ol' holiday/ summer wardrobe to wear there, I haven't even thought about it. Fun post surprises like the arrival of The WhitePepper order from last month and my Oh No Rachio! Good Vibes pin have meant I haven't missed out. My birthday is coming up this month so I've also been trying on things to add to my list of treats for me. Clicking: Allll the art graduates! I love keeping up with the latest output of designers that Scotland has to offer. While I popped along to ECA and Helen hit up DJCAD, I've also been checking out the others online. GSA always have a good fashion show and Gray's School of Art will hold their degree show in June. Looking up the hashtags on instagram can also open up a load of new inspiration to follow.